Aren't those party foods delectable? That cake looks absolutely delicious and the best part is, looking never put pounds on (although you may want to bake a cake that looks just like it!) Featuring two children digging right into their birthday cake on a bright yellow background, these free printable cards look delicious. Print this very colorful birthday card and send this to your friends on their birthday or to compliment your gift. This tasty birthday card is just right for any party or to send as an invitation to a young boy's birthday party. 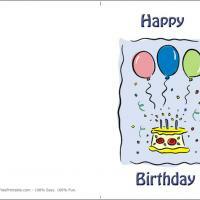 Enjoy these printable birthday cards today! Parties are fun! Birthday parties are even more fun because there is CAKE! These two young boys have their eyes set on that double-layered, chocolate-covered birthday treat. But wait, one young man just could not wait any longer to enjoy eating his cake. Just like you will not be able to wait to send out one of these fun and free printable birthday cards to someone special on your list. 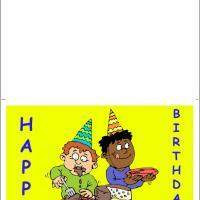 Party Food is a bright yellow card featuring two boys in colorful birthday hats. You have found just the right spot for printing and customizing all your cards. Enjoy some today. What is yellow and covered in chocolate? 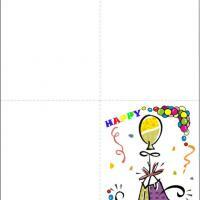 Party Food free printable birthday card that's what! 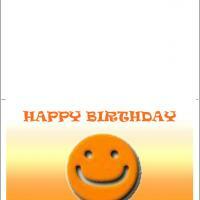 This birthday card features an eye-catching bright yellow background. The color showcases the purple letters spelling happy birthday on each side of the front cover. The stars of the card are eagerly awaiting digging into the chocolate-iced birthday cake while donning their chevron-striped birthday party hats. One could not wait any longer to have some sweets. You will not be able to wait to send this fun card to that special young birthday boy. The inside covers are blank. 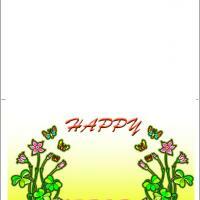 We invite you to use the custom print feature before printing the card to include a personal message.